The Quidel Triage BNP Test is a rapid, point-of-care fluorescence immunoassay used with the Quidel Triage MeterPro. The test is used to measure B-type natriuretic peptide (BNP) in EDTA anticoagulated whole blood or plasma specimens. 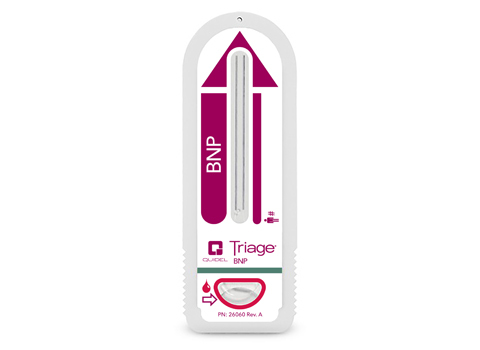 The Quidel Triage BNP Test is the first rapid BNP immunoassay indicated for risk stratification for both acute coronary syndrome and heart failure. Quidel Triage BNP [Package Insert]. San Diego, CA: Alere, Inc.; 2015. Maisel AS, et al., “Rapid measurement of B-type natriuretic peptide in the emergency diagnosis of heart failure”. N Engl J Med 2002; 347: 161−8. Cowie MR, et al., “Recommendations on the clinical use of B-type Natriuretic Peptide testing (BNP or NTproBNP) in the UK and Ireland”, The British Journal of Cardiology 2010; 17:76-80.